All rested and raring to go, we are, after our Easter break! We treated ourselves to a week away in the Yorkshire Dales as the weather was so nice (remember those few sunny days!). It was idyllic, but, had the potential for disaster because when we unpacked I realised that the lovely Steve had forgotten the chargers for the phones, bike lights and power cable for the Xbox – This, his ONE and ONLY job!!! Seriously??!!! The bike light makes for a very good torch for night time dog walking and getting back from the pub along unlit country roads. We had to navigate the lanes by moonlight (when there was any). This would have been romantic but for me muttering darkly (literally) about certain people’s forgetfulness! It’s a good job he’s funny (especially when he fell in the hedge – even the dogs laughed). We stayed at the very lovely Thornbrook Barn near Ingleton – and it only took 4 of those apparent 7 touches of marketing for us to decide. The park first came to our attention via an email from a caravan organisation a while ago. Then, when we had decided we wanted to spend Easter in the Dales, we searched online and we remembered it when we saw it. The website told us that they had everything we require, so it ticked all our boxes. We then read testimonials which convinced us the place was where we wanted to be. 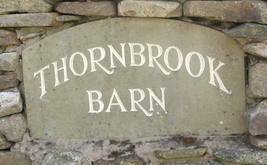 Thornbrook Barn won our business because; a) It had become familiar to us and b) Accurately targeted marketing got their park in front of us caravan-owning countryside lovers. When you create your marketing plan, put yourself in the shoes of your prospect. What are they looking for and how do you answer that need? People buy from people they trust, so getting your brand in front of them repeatedly and in different ways builds familiarity. Follow these steps to target your marketing efforts effectively. Always measure how effective your marketing is being – if something doesn’t work as well as others, then it needs changing in some way. Remember, Marketing is a building exercise – very rarely will you pick up a lifelong customer off the back of one email! For more information then call Joanne Clayton on 01274 965411. Right Message, Right Person, Right Time Top 10 Tips on Using LinkedIn for Business Are You Integrating Social Media into your Marketing Strategy? Previous Post (p) Is National Gardening Week an Opportunity for Direct Marketing? Next Post (n) On Yer Bike – and Get your Direct Marketing in Gear!